The cover of the transcript for the London branch of the Dickens Fellowship’s mock Trial of John Jasper, PR 4564 .J3 1914, Irish Collection, John J. Burns Library, Boston College. The Mystery of Edwin Drood is, perhaps, one of the most tantalizing unfinished works of nineteenth-century literature. Then novel began appearing in parts in April 1870, but when Dickens died on June 9, 1870, he had only finished the first six installments of the story. Chapman & Hall continued to publish the rest of the manuscript in its monthly installments after Dickens’s death until the story came to a halt with the mystery of Edwin Drood’s disappearance (or was it murder?) still unsolved. Naturally, there have been many attempts to unravel the mystery ranging from John Forster—Dickens’s friend and biographer—who claimed Dickens had told him the ending of the story, to a medium who wrote an ending purportedly while channeling Dickens’s spirit, to contemporary adaptations such as Drood and The Last Dickens, both published in 2009. 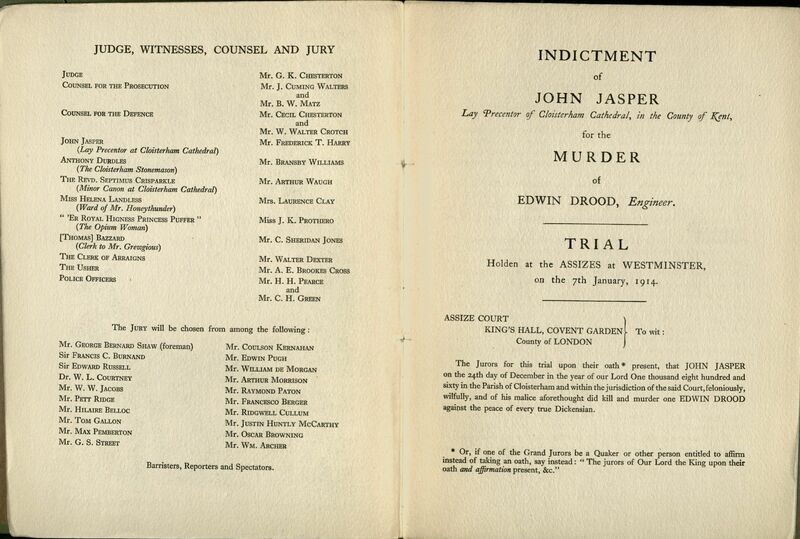 In 1914 the London branch of the Dickens Fellowship even put on a mock trial to try John Jasper (Edwin Drood’s uncle and guardian) for the murder of his nephew. The trial pulled its judge and jury from London literary greats including G. K. Chesterton who served as the judge and George Bernard Shaw who served as the foreman of the jury. The cast for the mock trial, PR 4564 .J3 1914, Irish Collection, John J. Burns Library , Boston College. Arthur Conan Doyle was also invited to join the proceedings, but declined. The trial ended with the jury convicting Jasper of manslaughter and G. K. Chesterton declaring everyone but himself in contempt of court. A full report of the proceedings can be found at the Burns Library in the Irish collection. The cultural fascination with Dickens’s last unsolved mystery continues today: The Dickens Museum in London has an exhibition titled “A Dickens Whodunit: Solving the Mystery of Edwin Drood“. Cover of volume one of The Mystery of Edwin Drood by Charles Dickens, 04-9187 General Collection, John J. Burns Library, Boston College. That this 190-page work is the catalyst for continued solutions, adaptations, rewritings, and other manifestations speaks to the popularity of Dickens as well as the importance of stories, especially stories that leave the reader without a satisfactory ending. So what would the experience of reading The Mystery of Edwin Drood have been like for the nineteenth-century reader? 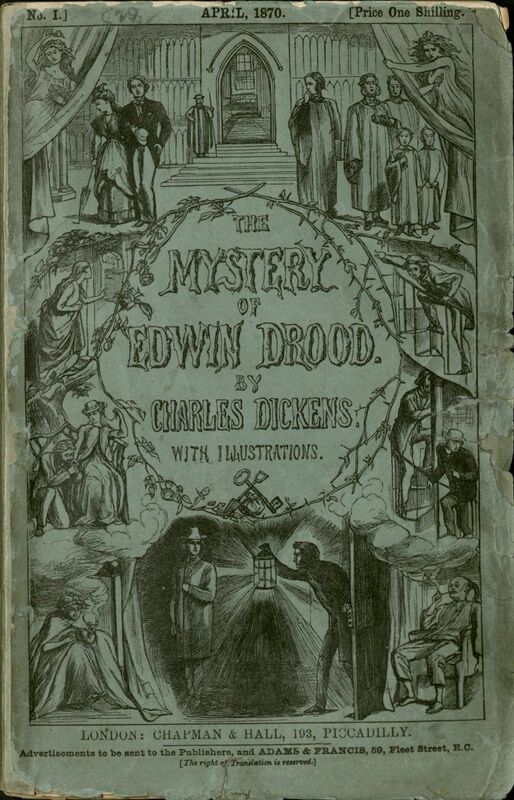 While we can’t go back in time to 1870 London to read the novel as it became available in bookstalls, the Burns Library does hold a first edition of the serial version of The Mystery of Edwin Drood. The novel is part of the library’s General collection and is housed in a protective clamshell box covered in dark green linen. Inside are the six parts of Dickens’s mystery novel. The original green paper covers are intact though the edges show signs of wear and splitting. Each installment of the novel is preceded by the illustrated cover and the “Edwin Drood Advertiser,” a collection of ads offering consumers everything from pianos to waterproofs. Both the cover and the contents of the ads help bibliographers determine which edition the parts are. 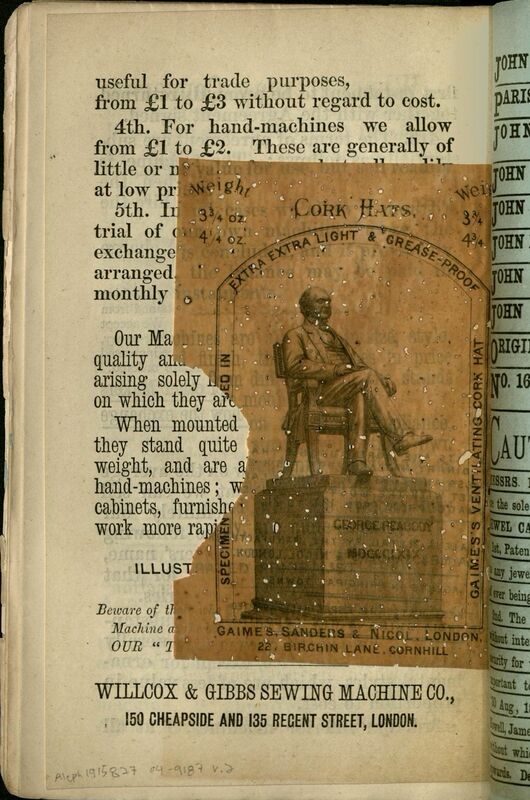 The “Cork Hats” advertisement in volmue two of The Mystery of Edwin Drood by Charles Dickens, 04-9187, General Collection, John J. Burns Library, Boston College. For the most part, the Burns Library copy adheres to the bibliographic points that Thomas Hatton and Arthur H. Cleaver set out in the 1973 edition of their book, A Bibliography of The Periodical Works of Charles Dickens: Bibliographical, Analytical, and Statistical including the presence of a rare advertisement for cork hats in the back of issue No. 2. Printed on a paper-thin sheet of real cork, this elusive advertisement is not usually found intact in first editions of the serial parts. A few discrepancies do exist in the Burns Library copy however, ranging from a missing advertisement for Chapman & Co.’s Patent Prepared Entire Wheat Flour in Part IV, extra inserts at the back of Part V, and incongruous back covers for both Parts I and VI. The parts are slim and about the height of a standard paperback novel. Though the covers have a tendency to flake off into small bits of green paper around the corners, the pamphlets are all in readable condition. An interesting detail to the parts is the fact that several of the small pamphlet-like volumes have a few uncut pages. This may indicate that the parts were never read but the wear to the covers and pages, including a water stain in Part VI, seems to indicate otherwise. Whatever its history (yet another mystery of this particular edition of the novel, as there is no provenance information in the catalog record), these six paper-covered parts create a far different reading experience than a typical hardback novel. The slimness of each installment, the monthly publication date, and the ever-present advertisements, contribute an immediacy to the reading of the novel: it firmly exists in a particular place and time, in a concrete world of readers, advertisers, and consumers. There is something especially pleasurable in reading a text in its original form undistracted by modern paratexts or editor’s footnotes. The shilling parts also allow for a better understanding of Dickens as a popular author through their casual, affordable formatting. If you would like to read The Mystery of Edwin Drood in its original serial format, please visit the Burns Library Reading Room. For anyone else who is interested in Dickens, I’ve also written another blog post about the Burns Library’s first edition of A Christmas Carol. If you have further questions, contact the Burns Reading Room at burnsref@bc.edu or by phone at (617)-552-4861. Dickens, Charles. The Mystery of Edwin Drood. London: Chapman & Hall, 1870. Hatton, Thomas & Arthur H. Cleaver. A Bibliography of the Periodical Works of Charles Dickens. New York: Haskell House Publishers, Ltd., 1973. 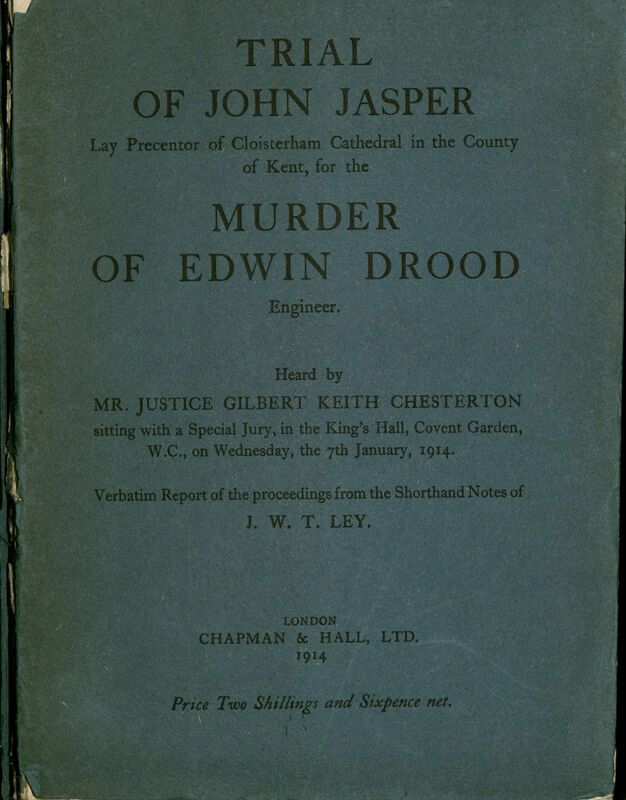 Trial of John Jasper:Lay Precentor of Cloisterham Cathedral in the Count of Kent for the Murder of Edwin Drood. London: Chapman & Hall, 1914. This entry was posted in Exhibits & Events, Featured Collections & Books, Student Posts and tagged Burns blog, burns blog boston college, burns library blog, charles dickens, dickens society, edwin drood, english authors, english literature, general collection burns library, irish collections burns library, literature burns library, nineteenth century literature, serialized novels, special collections and archives blog, unfinished novels, victorian literature. Bookmark the permalink.